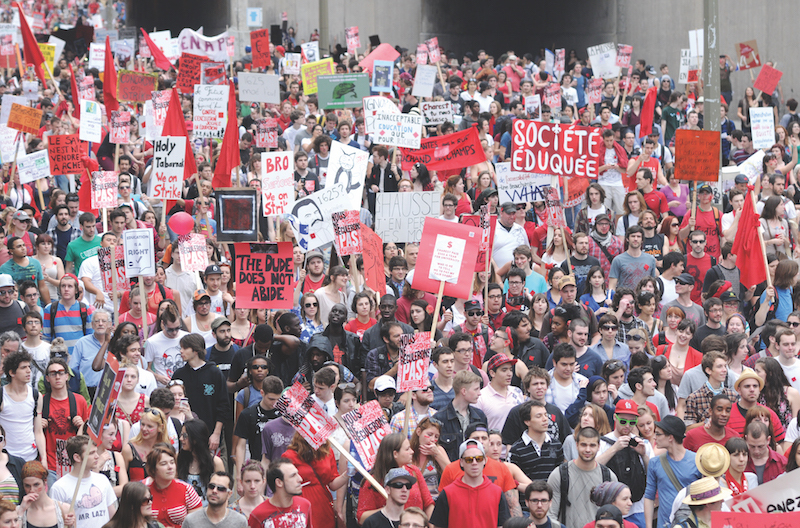 On March 22, 2012, roughly 200,000 students poured onto the streets of downtown Montreal in what was one of the most iconic moments of the 2012 Maple Spring movement against provincial tuition hikes. In support, students pinned red squares of fabric to their clothes to denounce austerity measures imposed by the government. One month prior, 36,000 students had voted to go on strike. This large-scale mobilization was in response to former Quebec Premier Jean Charest announcing gradual tuition hikes in March 2011. The Charest Liberal government proposed a province-wide tuition increase of $1,625 for university students, intended to be put into effect over a five-year period. Based on this plan, annual tuition fees would increase by $325 every year, rising from $2,168 to $3,793 by 2017. Various occupations and mobilizations continued during that spring and throughout the summer, leading up to a protest on November 8, 2011, when 30,000 people took to the streets of Montreal to oppose these hikes—this culminated with a sit-in held at the administration building of McGill University. The municipal government introduced P6—a bylaw which banned certain components of public protests. Photo by Navneet Pall. While the protest in March 2012, which marked the peak of the movement, saw no arrests, in the months that followed, thousands of protesters were detained, along with bystanders and journalists caught up in kettling, a crowd-control tactic that corrals groups of people into a confined space. As the summer of 2012 approached and the strike persisted, the municipal government of Montreal sought to curtail demonstrations by passing laws such as P6—a bylaw which banned protests not authorized by the city’s police and prohibited participants from wearing masks. This resulted in mass arrests—students endured police brutality, hefty fines and even harsh weather as the protests persevered into the winter months of early 2013. The Parti Québécois (PQ) was elected into office on September 4, 2012—the planned tuition hike was revoked one day after they took power. However, by December, the new government had laid out plans to slash the provincial budget. Among other affected institutions, Concordia University announced it was facing $13.2-million in cuts—cuts which caused the university to declare a deficit. In February 2013, the PQ announced a three per cent tuition fee increase, amounting to $70 annually. This would increase tuition by $254 per year over a seven-year period, according to Maclean’s, which would be slightly less than the $325 hike proposed by the Liberal government. This was an act students condemned, and it led to renewed demonstrations, resulting in mass arrests during the following weeks. After a long period of dwindling mobilization, a resurgence nicknamed Printemps 2015 restarted not just for students, but for all who were discouraged by the Quebec government’s budget cuts and the direction the province was headed. Now, five years later, those who were involved in the Maple Spring movement reflect on the movement’s success, the evolution of the anti-austerity mobilization and the future of access to education for students in Quebec. Many of Concordia’s current students were in their first year of university when the strike began. One student among them is Lucinda Marshall-Kiparissis, the general coordinator of the Concordia Student Union (CSU). “I joined the PSSA [Political Science Students’ Association] strike mob committee to help out with organizing, with picketing,” Marshall-Kiparissis said. The committee was tasked with organizing pickets and other events related to the strike. “At that point, I wasn’t in a lot of organizing work because I was still getting my feet wet.” Nonetheless, she described herself as a very enthusiastic participant. Marshall-Kiparissis said mobilization in the form of strikes and large-scale protests was more common among francophone universities at the time. “So for Concordia to go on strike, this was one of the first major times that an Anglophone student community joined that greater movement,” Marshall-Kiparissis said. 36,000 students vote to go on strike in February 2012. Photo by Navneet Pall. Alex Tyrrell, the leader of the Green Party of Quebec, attended various student protests at the time. He said he would often record the protests and upload those videos to Youtube to document the movement, particularly focusing on police brutality and other incidents. While filming, Tyrrell was stopped by law enforcement officials. “I got arrested one time for P6 on May 22, 2012,” Tyrrell said. “That was immediately after they passed the special law.” The Montreal P6 bylaw had been imposed by then-Mayor of Montreal Gérald Tremblay in 2012 to counter student protesting. “You had to provide your itinerary before protesting, otherwise it would end in mass arrests,” Tyrrell said. On the day of Tyrrell’s arrest, each detainee was subjected to an invasive search, one by one, and then put on a bus and were read their rights. Tyrrell said he and the bus loads of detained protesters were taken to the Centre Opérationnel Est in Saint-Léonard to be processed. He was released at 5 a.m. the next morning. Throughout the protests, participants faced police brutality and mass arrests. Photo by Navneet Pall. He described the mass arrests and the laws causing components of student protests to be illegal, as a form of oppression administered by the Liberal government. “Being arrested is frowned upon—a lot of people think it’s a very negative thing,” Tyrrell said. “I’ve only actually recently started talking about it publicly because now it’s actually been proven unconstitutional.” He said before the arrests were deemed unconstitutional, people would warn him that a criminal record could affect his political career. P6 was ruled illegitimate in June 2016 by the Quebec Superior Court Justice Chantal Masse, as two crucial points of the bylaw were unconstitutional, including Article 2.1, which made it illegal to hold a protest without an itinerary registered with police beforehand. Additionally, Article 3.2 was marked wrongful as it prevented the wearing of masks during a protest. Tyrrell said after acquiring leadership of the Green Party of Quebec, he found himself in situations where could debate with Geoffrey Kelley, a former minister of the Liberal government, about a generation wanting to protest being met with police brutality and mass arrests. Over the course of the protests, Tyrrell said he lost confidence in the integrity of the police force. During April 2012, protesting peacefully increasingly put the physical safety of participants at risk. He said it was often other protesters who would intervene when some participants began vandalizing. “The protest would try to police itself,” Tyrrell said. Former Quebec Education Minister Line Beauchamp mocked in protest photo. Photo by Sophia Loffreda. Over the course of the protests, SPVM law enforcement officials requested more than $7.3 million in overtime income for work between February and June 2012, according to the McGill Daily. For May and June alone, SPVM police officers were paid $5.6 million for overtime. La fraternité des policiers et policières de Montréal—the union representing SPVM police officers—estimated that special intervention units were paid between $2.5 to $3 million during the strike, as they were required to assist more than 150 times during an 11-week period, according to the McGill Daily. Tyrrell recounted an instance of police brutality faced by a friend of his during one protest. He described his friend fleeing riot police officers, but, as they chased him, Tyrrell’s friend stopped to turn himself in. Despite his compliance, police pushed the young man from behind and threw him to the ground, causing him to fracture his wrist. “Then they put him in handcuffs with a broken wrist and they cut the straps of his backpack off,” Tyrrell said. Palynchuk said the evidence to be used against him at the trial consisted of security tapes which didn’t contain any recognizable footage of him. On September 18, 2012, the day before Palynchuk’s tribunal, newly-appointed Concordia President Alan Shepard withdrew all charges administered by the university, as a fresh start between administration and students. The Association pour une solidarité syndicale étudiante (ASSÉ), a Canadian student union prominent within the anti-austerity movement, obtained a large number of members over the course of the protests. “ASSÉ went from about 40,000 members before the strike [to] 75,000 after,” said Marion Miller, a member of ASSÉ’s training committee. After 2012, ASSÉ dropped in male* involvement and membership. According to Miller, ASSÉ had trouble making quorum last congress—in other words, reaching a minimum number of members needed to validate the proceedings of that meeting, which took place between February 25 and 26. “It’s a quiet period,” Miller said. In response to rumours made towards ASSÉ disbanding, Miller said she understands the assumption, as ASSÉ has not been as externally active in recent years. However, she denied the claim. “If [ASSÉ] were to be at the end of an era, they could rebuild,” said Miller. However, she said ASSÉ is not at the end of era. “The strike was against tuition hikes, but the long-term goal was free education and redistribution of wealth,” Tyrrell said. Tyrrell said a way the Quebec government could provide free education is by not only removing tax breaks to private corporations, but by generating revenues from a number of sources. Some suggestions include a carbon tax and mining royalties—this is the model proposed by the Green Party of Quebec. *This article has been updated for accuracy and clarity. The Concordian regrets the error.